There are two bus stations in Seville and one train station with great connections to the whole of Andalusia. The main bus station, at Plaza de las Armas, is in the center of the city while the other two are a little further away. Further down the page you'll find more details on each station, but first up - which will you most likely ned to get to your next destination? From Seville by Bus or Train? To Madrid The the train, it's much quicker. To Malaga The train is usually quicker, but some buses are not much slower. To Ronda Take the bus from Prado de San Sebastian Bus Station. To Cadiz and Jerez Similar price and journey time, but the Prado de San Sebastian bus station is more central than the train station. To Barcelona Take the train or fly. To Lisbon T ake the bus from either Plaza de Armas or Prado de San Sebastian. To Faro Take the bus from Plaza de Armas. This is Seville's main train station. You will often see 'Sevilla San Bernardo' on - ignore it and select Santa Justa. San Bernardo is just a metro and local train stop. Where is it? A little out of the center on Avenida de Kansas - you'll most probably need to get a taxi to your hotel from here. Nearest Metro: Santa Justa doesn't have a metro station yet: the nearest is Nervión. 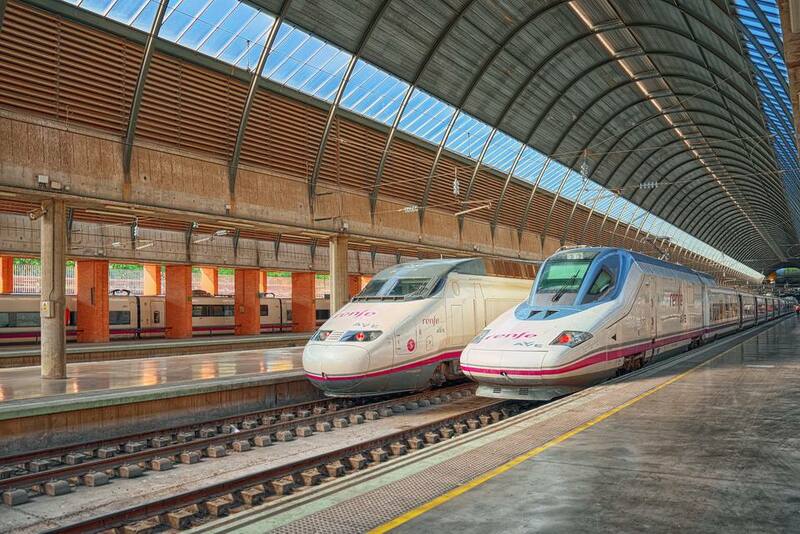 For Travel to: As Seville's only train station, all train routes from Seville start here, including the AVE high speed train. Where is it? By the river, opposite the shopping mall, on Avenida Torneo. Just two minutes walk from the bullring. Nearest Metro: None. But Plaza de Armas is a short walk from the city center. For Travel to: The Plaza de las Armas Bus Station is the station you need for national journeys. From here you can catch a bus to Salamanca, Madrid, León, Cáceres, Bilbao and San Sebastián as well as Lisbon and Lagos in Portugal. You can also get to Matalascañas (Seville's nearest beach) and Huelva from Plaza de las Armas, but for most routes within Andalusia, see the Prado de San Sebastián Bus Station (below). Nearest Metro: Prado de San Sebastián. For Travel to Mainly for regional Andalusia services, including Algeciras, Almeria, Cadiz, Conil, Cordoba, Gilbraltar, Granada, Jerez, Marbella, Ronda and Tarifa. But for Huelva and Matalascañas (Seville's nearest beach) see the bus station at Plaza de las Armas (above).